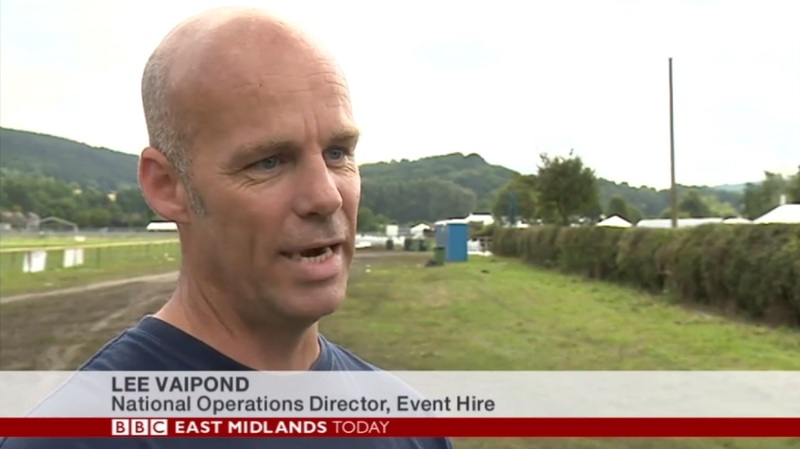 Eagle-eyed viewers amongst you may have seen our National Operations Director, Lee Vipond, make an appearance on BBC East Midlands Today last Friday. Lee was on site at the Bakewell Show in Derbyshire which had been affected by the inclement weather conditions over the past week. The unpredictable weather and the heavy rain also forced the unprecedented cancellation of the ‘Y Not’ Festival in Derbyshire last weekend. Of course, outdoor event organisers always rely on the great British weather to play its part, and sometimes it just doesn’t play ball. Rest assured, however, that the Event Hire team will always go the extra mile to ensure that schedules are kept to as close as possible. When it comes to outdoor furniture hire, the range at Event Hire UK is second to none, providing event organisers with the ultimate choice in terms of patio tables and chairs, BBQ hire, quick tent hire, patio umbrellas hire, outdoor rattan furniture hire, patio heaters for hire and much more. Our one stop shop provides you with a hassle free and seamless hire experience as we know how stressful the build up to a busy event can be. Why not contact a member of our expert sales team today who will be delighted to provide you with everything you need to help you create a fabulous outdoor event….and keep your finger crossed that the weather stays fine!